Flash drives with logo print area as large as it gets for a promotional memory stick. Promote, in a word. 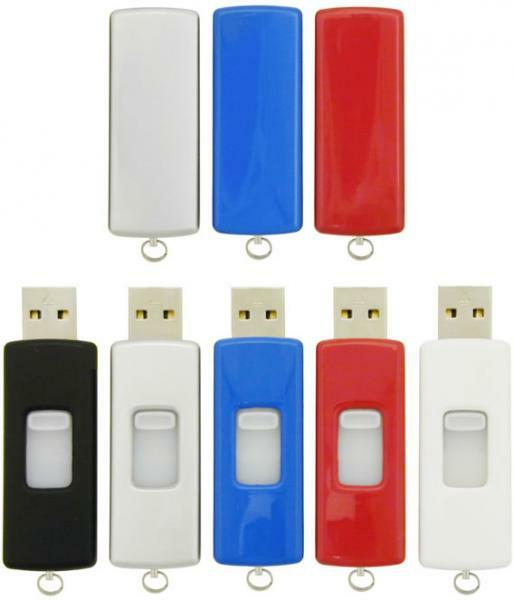 USB drive is very appropriate for business advertising with printed website address, phone number. Features are co-polymer case, retractable, port ready USB connectivity with 2 GB flash memory. Plug and play, supports Windows XP and up, MAC 0S 9 x or above, USB 2.0 is standard. Optional Flash Drive Data Loading, add $.60 each. Packed in plastic tray in carton. Available with Four Color Process Printed, see Flash Drives Printed below. Flash Drives delivery from date of an order varies being 3-4 weeks. PII Exclusive: For 8 GB Flash Drives add just $1.50 each unit. Price includes one color printed on one side in an area 1 3/4" w x 5/8" h.
color add an another set up and running charge of $.20 each. running charge of $.50 each. 4CP on white drives only.